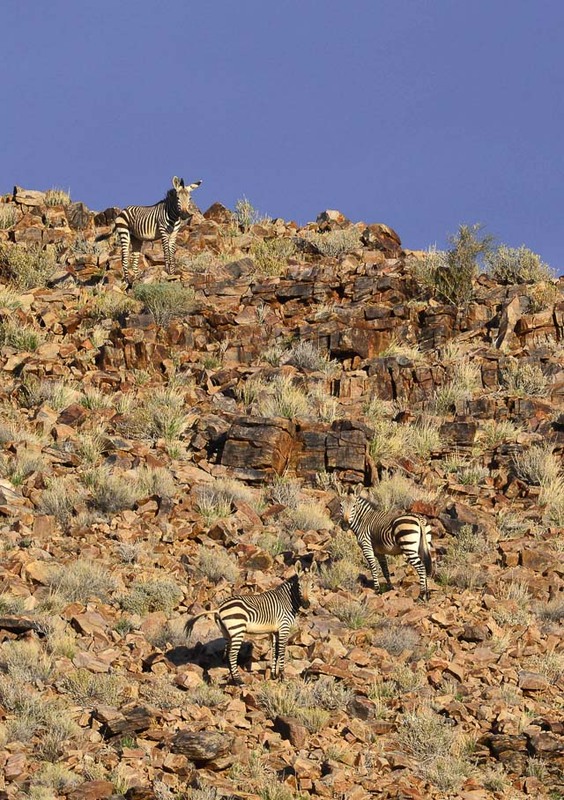 Kgalagadi-Namibia Trip Report Part-2 - the Gondwana Collection of lodges rocks! This part of our trip was going to be like no other trip of ours. 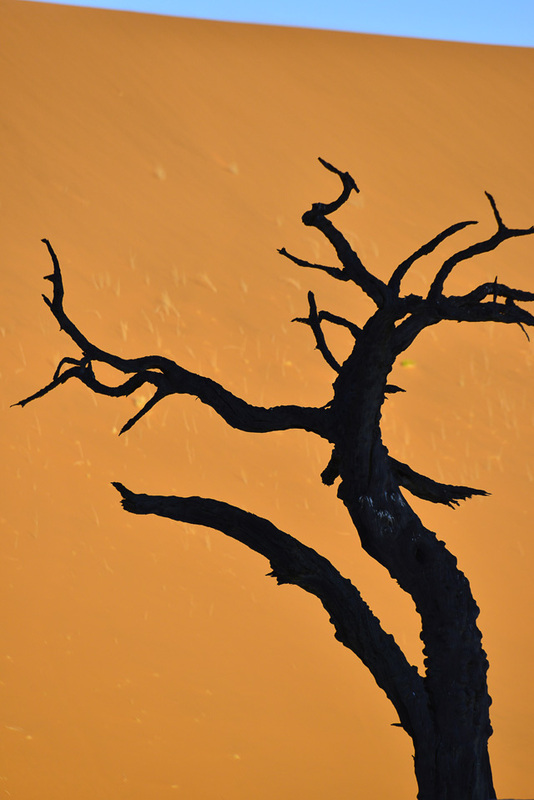 Firstly because this was our first time to the South of Namibia, first time to stay at the Gondwana Collection of Lodges and first time to not be on a big-5 photo safari! We left Mata Mata gate and the Namibian border at 9 am on the 24th December. 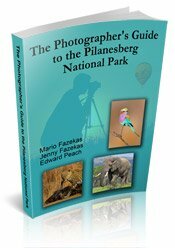 We had no problems at the border – after staying in the Park for 10 days; our passports and papers had all been checked at Twee Rivieren when we first arrived in the park. After filling out our forms and another quick check by officials we left heading on the C15 towards Stampriet. The C15 route from Mata Mata to Stampriet is a lovely scenic road that follows the Auob River and takes you through river areas on the right and high rocky outcrops on the left. It’s a scenic road in good condition. 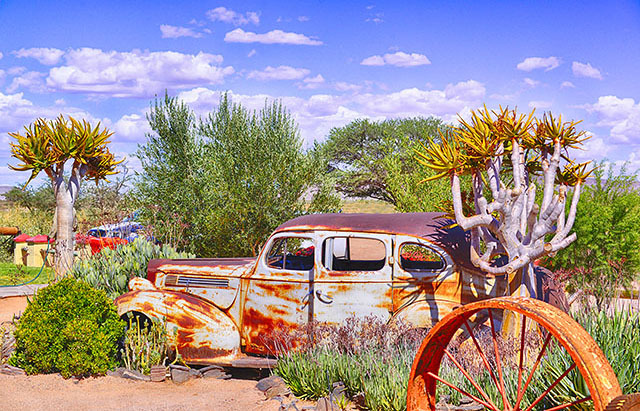 We reached Stampriet at 12pm and decided to pop in to see the Kalahari Farmhouse. What a lovely place, we were warmly greeted by a helpful and friendly lady who showed us around. It has a great curio shop with everything one would need, a coffee shop and 11 lovely stone units. 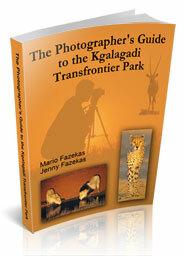 It’s a great stop over if you are coming from the Kgalagadi to Namibia. This is a working farm that keeps the kitchens of all the southern Gondwana lodges stocked with fresh produce throughout the year. After taking some photographs we left for our 1st night’s stay at Kalahari Anib Lodge - 23 kilometres from the Farmhouse on the C20 tar road and 30 km north-east of Mariental. We arrived at 2pm- were warmly welcomed by staff and shown to our chalet; bottled water and a bottle of wine was on ice for us- what a nice start! Once we settled into the chalet we went for lunch on the veranda, it overlooks one swimming pool and a waterhole. We ordered Fish and chips- the best fish and chip I had ever tasted. After lunch we went and freshened up for our Sunset game drive. The Sunset drive took us to the Auob River which runs through the property but we could not cross because it was flowing. Our sightings were good; Gemsbok, Blue Wildebeest, Springbok and Giraffe. 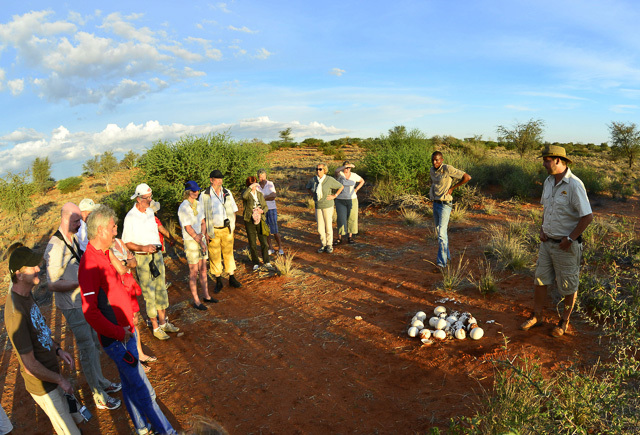 We stopped at an Ostrich nest and the guide told us about the Ostrich and her eggs, we found the story and information very interesting. 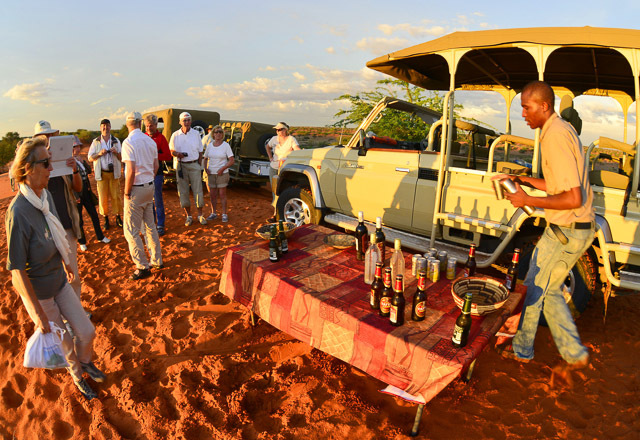 Then it was up onto a large sand dune for sun-downers and a great sunset overlooking the vast Kalahari Savannah. Dinner was in full swing when we arrived back at the lodge. 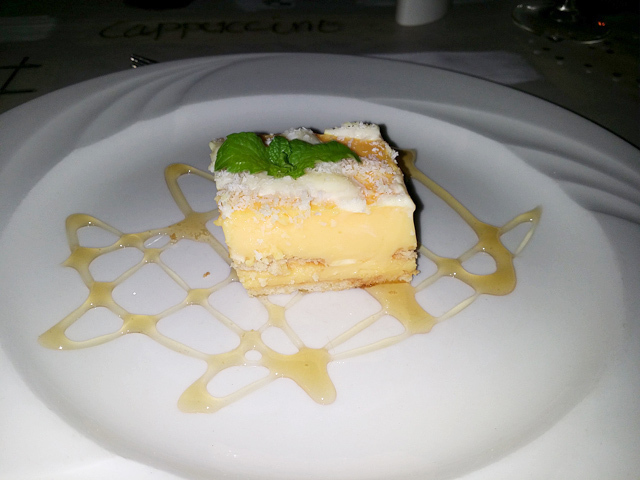 Wow the food was excellent, from starter to sweets and the vibe was just as good. 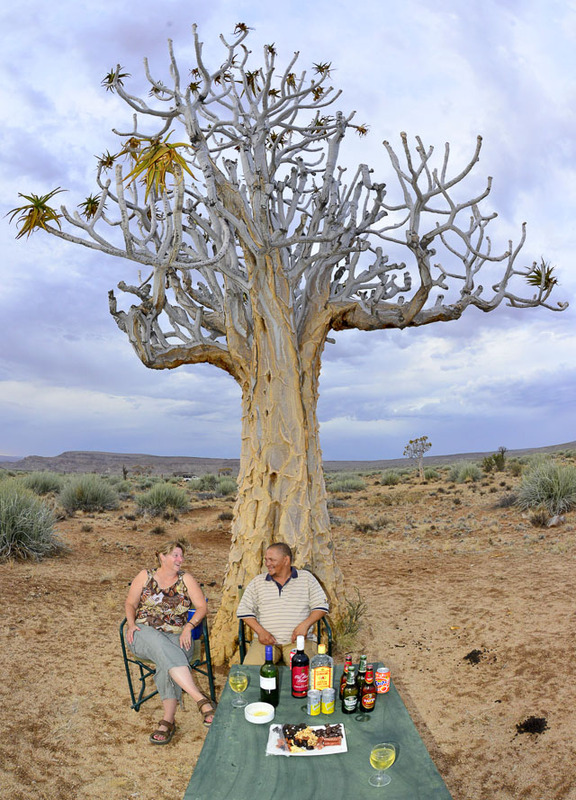 Our next stop was Namib Desert Lodge. We left at 6 am Christmas day with a great breakfast pack to keep us going on our journey. 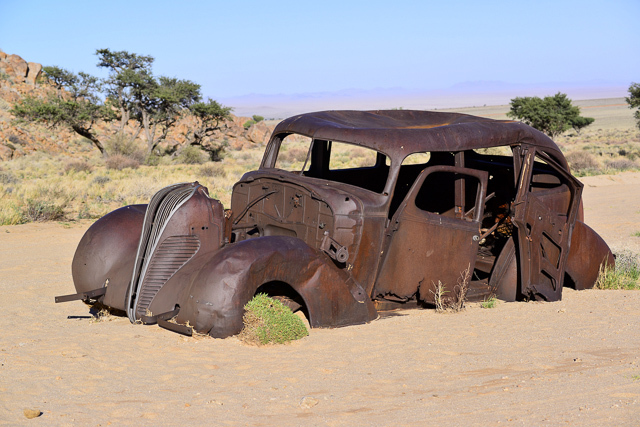 We headed towards Mariental - turned onto the C19 and headed towards Maltahohe, it was still tar that only ended after Maltahohe. We then turned onto the C14 gravel road and headed up northwest towards Solitaire. (All these roads were in very good condition and scenic). Reaching Solitaire at 10am- this lovely little town has so much to offer; we spent some time photographing the old cars, then we had a piece of apple pie and a coke at the lovely little bakery. 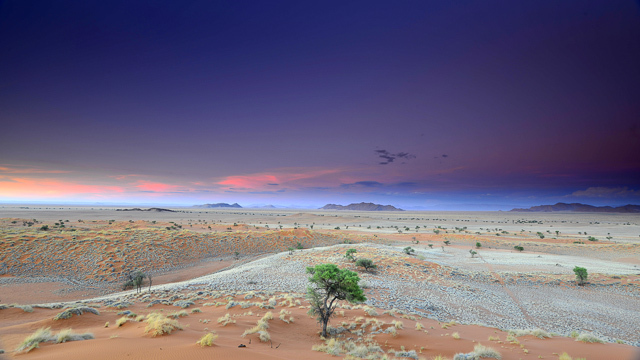 Namib Desert Lodge is 27km south of Solitaire and then it is another 3km from the turnoff to the lodge, so it is easy to just pop in and take more photographs or refuel your vehicle at Solitaire. We would spend the next 2 days at this lovely Lodge. We arrived at 12pm and the first things we saw where the huge red fossilised dunes that tower above the lodge; they stretch from one side of the lodge to way past the other side. 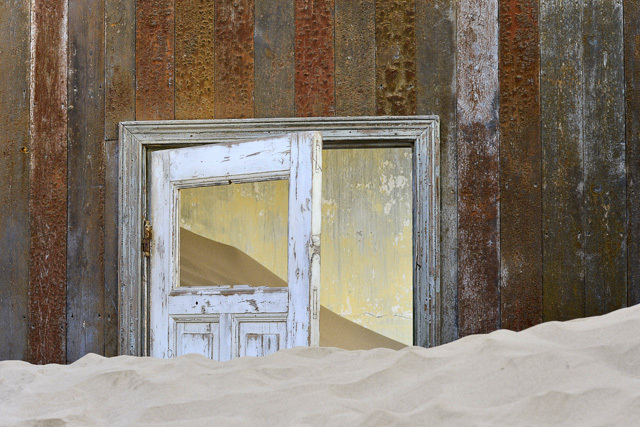 Kirsten, the lodge manager, showed us round the lodge and took us to our chalet, which faced the petrified dunes. A packet of Christmas cookies was waiting for us in our chalet, what a nice touch. Once we unpacked we relaxed for a while and then did a short walk along the dry riverbed where we had a lovely sighting of Rosyfaced Lovebirds. Then it was time for a shower before heading out on our Sunset drive that took us up onto the large dunes that overlook the vast plains that lead up to the mountains and from here you can see the herds of Gemsbok and Springbok. 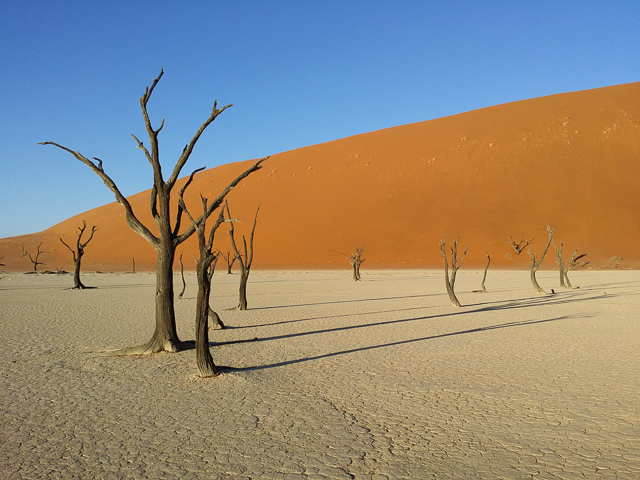 Our guide then took us to see their new Dune Star Camp set in the red sand dunes of the Namib Desert. (There is a 7 to 10km hike to get to the lodge because it is a hiking camp, but that may change in the near future). The views are lovely and it is very peaceful, we had our sundowners there then headed back to the lodge for dinner. We sat outside for most of our meals because it was so hot and we wanted to look at the fossilised dunes and watch the waterhole. Dinner was nice - we had a salmon and asparagus starter followed by either Kudu steak or duck with veg and gravy, then chocolate mousse for pudding. 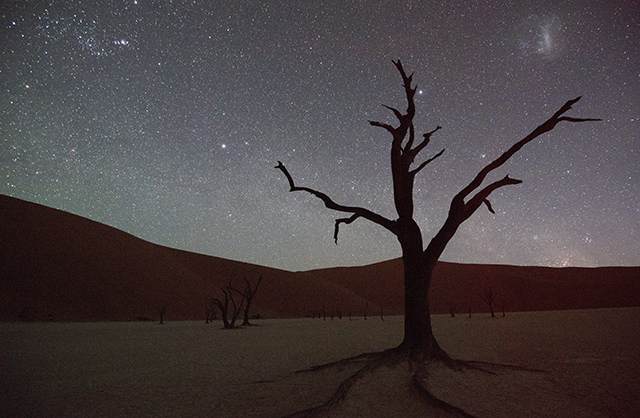 Over the next three days we visited the Sossusvlei area and went to Deadvlei and Sesriem Canyon. 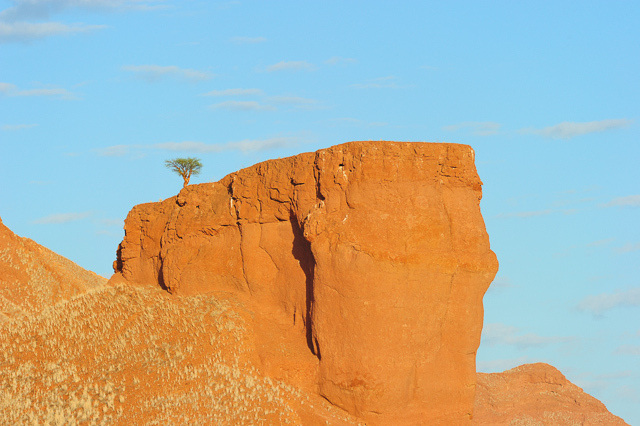 It is 60km from the lodge to Namib Naukluft Park Sesriem/Sossusvlei main gate; once you have paid your entrance fee you then precede to the next gate. 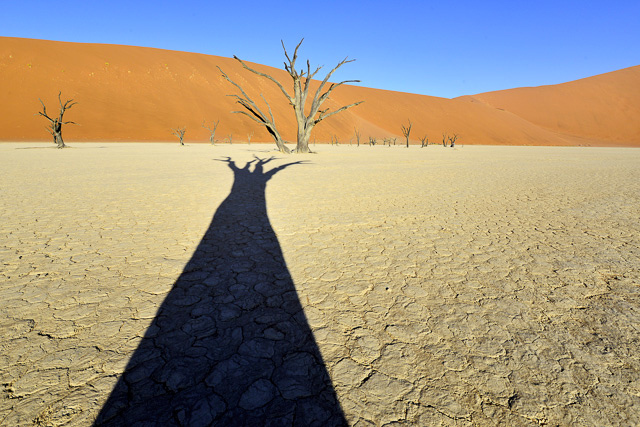 If you want to visit Sossusvlei, where you will find Deadvlei and other interesting dunes and Vleis, it will be another 60km of traveling inside the park on a tar road to the main parking area but if you have a 4 X 4 you can go another 5km to the 4 X 4 parking area which is closer to Sossusvlei and Deadvlei. 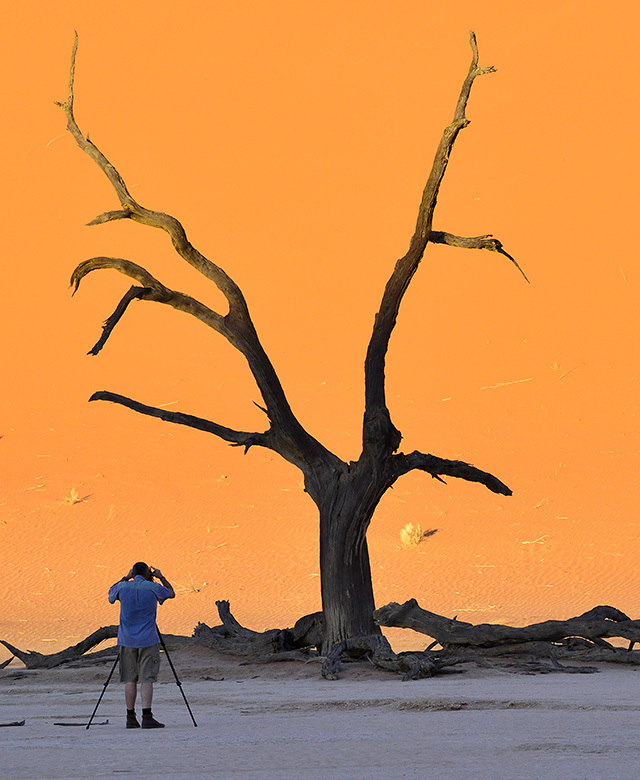 We spent some time at Deadvlei which is a 1.1 km walk from the 4 X 4 parking area but from the main parking area it will be a 4.5km walk to Deadvlei. A word of warning, don’t stay out too late, the area is not very well marked and if you don’t have a guide you could get lost (we did one night and it took us an hour to find our vehicle, it was an adventure which we would not like to repeat). It was time to say farewell and move onto our next stop, we left with our breakfast pack early in the morning around 7–15am and we headed down the C19 then turned onto the C27 (this first part of the C27 is very scenic and we saw a lot of game like Zebra, Oryx, Jackal and Springbok. It is about 190km from the lodge to the town of Betta. We carried on the C27 but you can also turn onto the D707 which we were only told later was a much more scenic road (will do it next time). We carried on till we got to the C13 turned right, it’s about 287km from the lodge to C13 Aus turnoff, then down towards Aus on the B4 turnoff (384km of gravel road till you reach tar). We did not go into Aus but carried on towards Luderitz for 2.2km when we saw the Klein-Aus Vista sign on the left. 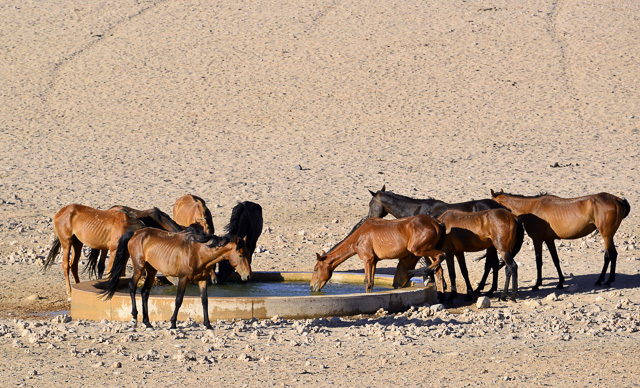 All in all it was about 393km from Namib Desert Lodge to the Desert Horse Inn. 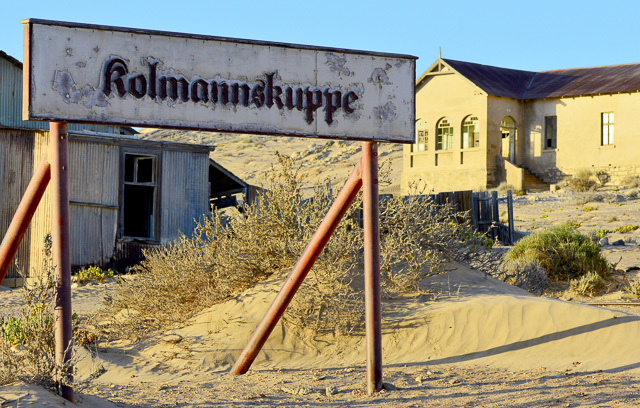 We arrived at Klein-Aus Vista - Desert Horse Inn to the feeling we had just stepped into the Wild West. The Lodge is in the Aus Mountains- on one side you have the lovely mountains and the other you have the beautiful desert plains. After chatting to Piet, the owner and lodge manager, we were then shown round the lodge and to our chalet. The chalet was lovely and very nicely decorated. 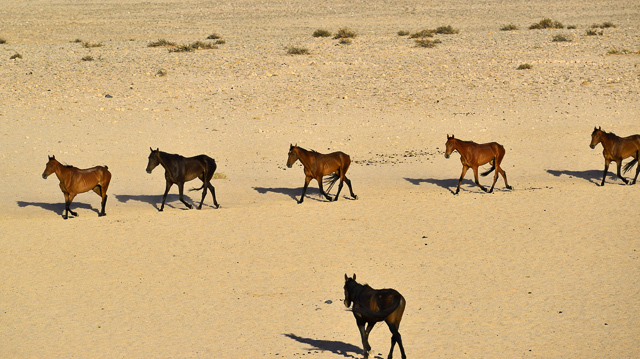 A quick unpack then we headed off to see the Namib Wild Horses just 20km down the road. You do not need a permit to see the horses and we spent some time with them as they came down to drink then it was back to the lodge for dinner. 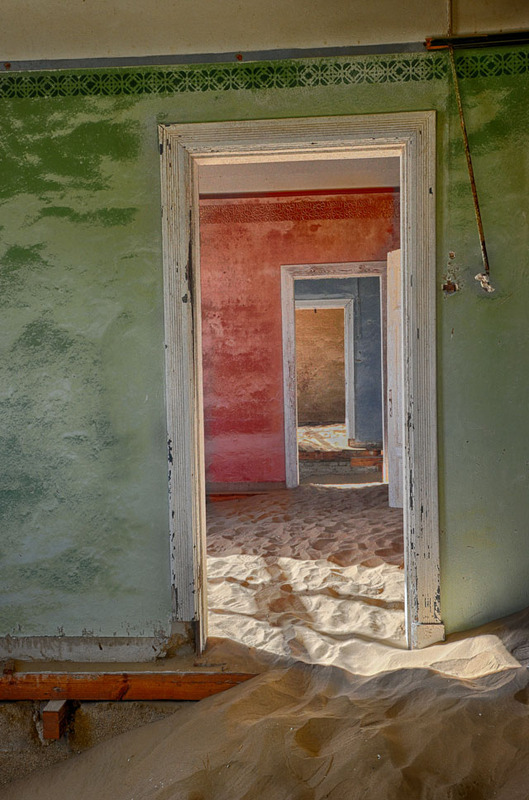 The next day we left early around 4.55am for the 120km run to Kolmanskop - we got to the gate at 6am bought our permit and went in. 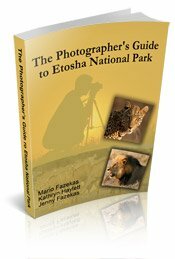 We paid for a photographer’s permit which was R200.00 rand each as this allows you to go in before the rest of the people arrive. We spent a good couple of hours photographing the different houses and other interesting subjects that we found inside the houses. Then we went into Luderitz for lunch and found this lovely little coffee shop called Diaz Coffee shop. Curried mince jaffels with spiral chips and salad, waffle and ice cream….wow what a tasty meal! Back at the lodge we went to have a look at the other Lodge called Eagles Nest, which is set against large boulders in the side of the mountain - wow what a view from the nice cosy chalets! After 4 wonderful days it was time to leave and head down to Canyon Lodge in the Fish River Canyon area for our last 3 days in Namibia. We left the lodge on the 2nd Jan 2014 at 6.30am taking the C13 tar road all the way down to Rosh Pinah. 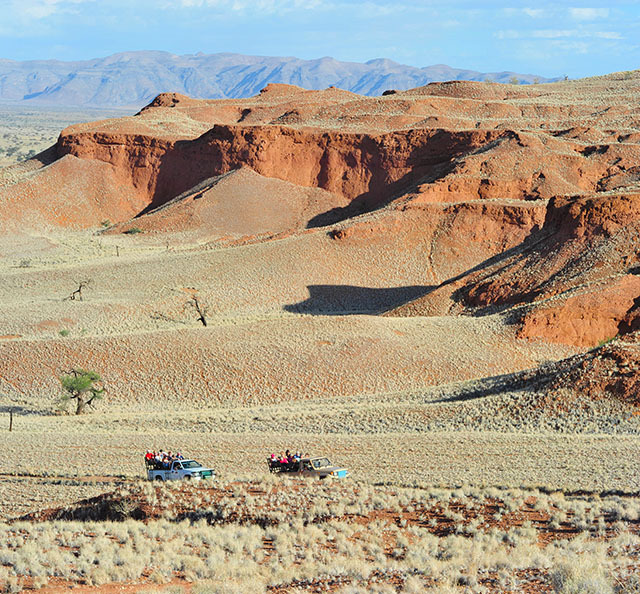 Then we followed the C13, following the Orange River through Ai-Ais Richtersveld Transfrontier Park. (This was not our favourite part of our journey as we found the area to be more like driving through an old mine dumping ground). The river on the right hand side is very pretty but there are lots of barrels, worker huts and mining/construction sites dotted along the way on both sides of the border. We turned onto the C37 Ai-Ais road and followed that all the way to Canyon Lodge. (Next time we will take the B4 to Seeheim then the C12 all the way down to the C37). The road leading to Canyon Lodge splits, the left takes you to Canyon Village which is the sister lodge to Canyon Lodge just 2km away. We popped in to see Canyon Village and what a lovely place, set at the foot of rocky outcrops. After taking a few photographs we left for our lodge. We arrived at the lodge at 12.10pm so it took us about 5 hours. Ally, one of the mangers, warmly welcomed us and then showed us to our chalet which was a long walk from the main building and up a few stairs, but well worth it! The chalet was set between massive boulders with great views of the rocky outcrops and over the plains- we had great sunsets from here! Over the next 3 days we went exploring the area- the first day we went to visit the Canyon Roadhouse, this is like no other lodge I have seen. It takes you back to the good old days with old cars everywhere. It was truly amazing to see. 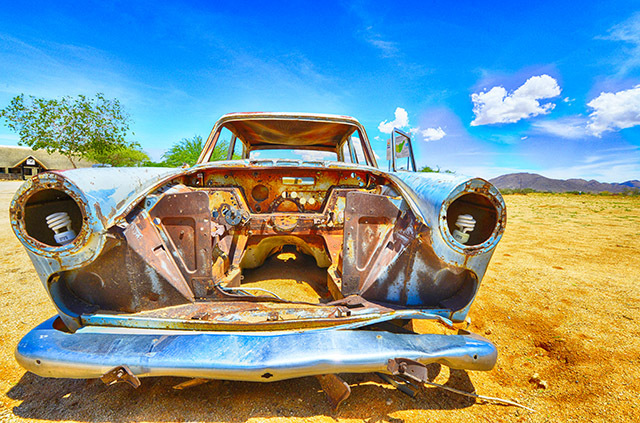 We photographed a few old desert cars (Solitaire, you have competition!) then we had lunch- a toasted sandwich, chips and a piece of their famous Amarula cheesecake, mmmm it was nice. Then it was back to the lodge for dinner. We had all our meals outside due to the lovely hot weather and we wanted a view. The buffet meals were all great- lentil soup, Kudu steak and beef with veg and to finish it off strawberry tart, it was all yum and the meat was so tender! The 2nd day we went on a 4 X 4 self-drive. 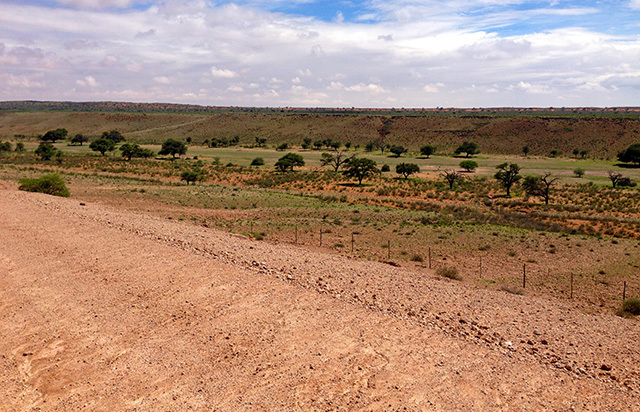 This was great fun and very scenic with beautiful views of rocky outcrops and quiver trees and animals like Oryx, Mountain zebra and Blue Wildebeest were seen along the drive. I would recommend this drive but you do need a 4 X 4 vehicle because some areas are very rocky especially the viewpoints along the route. Then it was back to the lodge for lunch- Cajun chicken salad for me and Mario had the Game salad, both were great. That afternoon we took a drive up to their Canyon Mountain Camp and had a look round this self-catering camp which is 6 km away from the Canyon lodge. It is very nice for people who want to self-cater and be away from the rest of the mob. 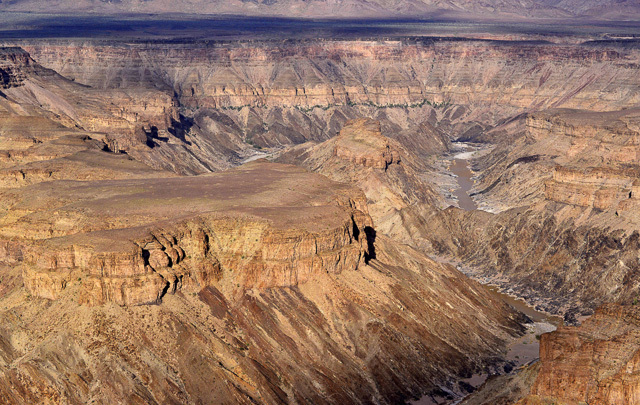 Our 3rd day we went to see the Fish River Canyon with our guide Fredrick- you can self-drive to the Canyon but we decided to go with a field guide from the lodge. The weather was not on our side that day as it was overcast with some light rain but we managed to get a good idea of the enormity and the beauty of the Canyon. 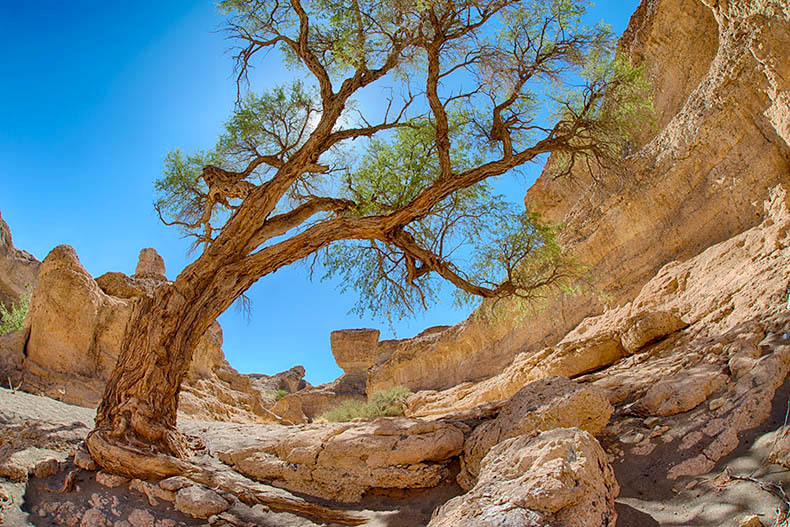 It is the 2nd largest canyon in the world after the Grand Canyon in the USA and well worth a visit. We found the view from the main area very good but there are other view points along the way that are just as good. After taking some photographs is was time to head back to the lodge for breakfast. 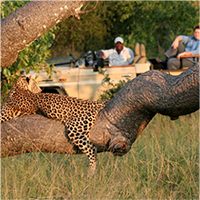 That afternoon our guide (Frederick) took us for a sun-downer drive to the Quiver trees just 5 kilometers from the lodge. 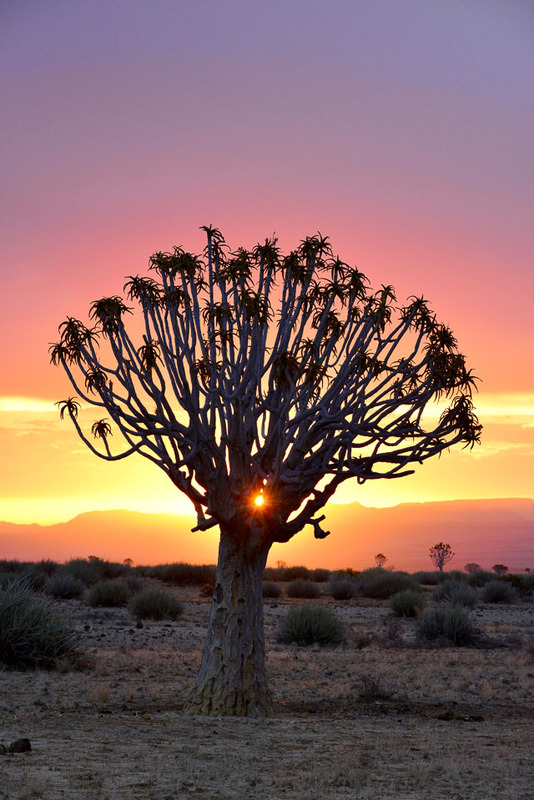 We had a great sunset overlooking the quiver trees with mountains in the background and then it was back to the lodge for dinner- feta and garlic parcels, oryx steak, roast lamb with salad and veg then lemon tart to finish off another great meal. After another great stay it was time to leave this beautiful place and head back home to South Africa. We left at 7.30am after a lovely breakfast and headed up the C37 to the C12 that then took us to the main road B3. We refuelled at Karasburg- don’t stop at the Puma fuel station rather go round the corner to the Engen or Total garage as it is much cleaner and the service is better. 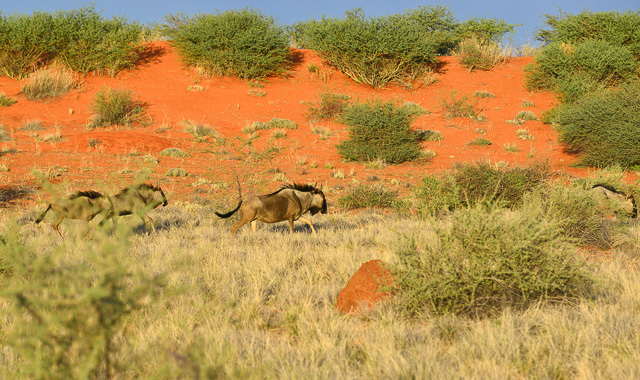 The stretch from the lodge to the Ariamsvlei border is 250km, then another 150km to Upington - all in all a 4 hour trip. From there it was onto our 1 night pit stop at Red Sands Country Lodge, which is just 15 km before reaching Kuruman then another 2km from the main road to the lodge. We arrived at 2-15pm had a light lunch and a good sleep then went to dinner - buffet style and very nice. The trip took us 7 hours from Canyon Lodge to Red Sands. 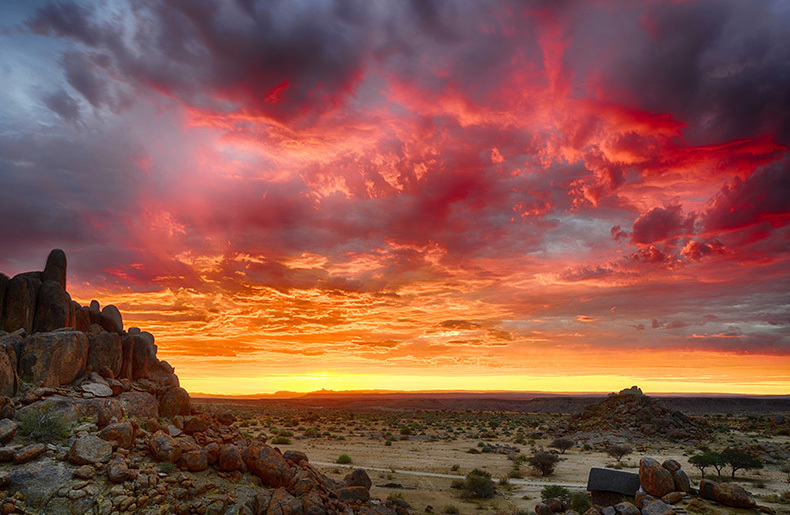 We had a great trip and found all the different lodges very pleasant and affordable; it is something we would love to do again….Thank you Namibia and Gondwana Collection of Lodges!